My friend Milan Hulsing lives in Cairo for a few years. Last month he was in Amsterdam, mainly to sort out his record collection and to move the biggest part to a depot. I was among the people that he invited to help moving all the boxes with records. With five people it took us six hours. At the end of the day the house was empty, except for some garbage, some furniture that he didn’t want to see again, and a cassette tape that was found behind a computer desk. On the cassette was written Asia strange . Before I could ask, Milan said: “Of course you can have it” . Every now and then the tape was mentioned in our conversations, but the longer I didn’t hear it, the less I believed it existed. But to cut a long story short: I have the tape here in front of me now. And I have listened to it. And it is all true! 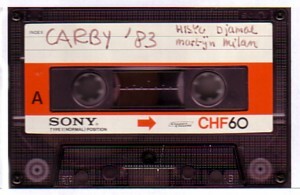 The name of the band was Garby and the tape is from 1983. Hisko, Milan´s brother plays guitar and sings the lead vocals, Martijn played guitar too, and a guy named Djawal was the drummer. Milan plays the flute. It is not music I would buy on a CD, but since this is a friend of me, at the age of eleven, and also because I have been believing that it was just a joke for years, I wanted to share this with you today. Here is Carby with a song about drugs. There are no names on the cassette, but I called it Broken line . And, for the die hards, here is the complete demo. Ha ha, thanks for the attention. It’s telling you picked out the one song without flute (-; There’s one song about cowboys and war where the flute is actually working pretty good, in a hippie-trippy way. One thing, the name of the boy on drums is Djamal, not Djawal. Just a small thing, but the internet is already so full of nonsense. Oh, one more thing, not to spam your site or anything, but if this is ’83 I was 9.